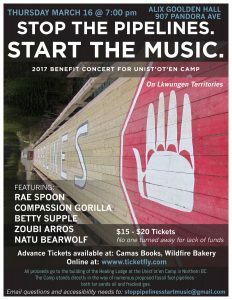 On Thursday, March 16th, please join at Alix Goolden Hall (907 Pandora) for an Unist’ot’en Camp benefit concert. Doors open at 7PM, event begins at 7:30, and runs until 10PM. The Unist’ot’en have sustained an unbroken relationship with their territory for thousands of years and have continued to practice their traditions in spite of intense and ongoing colonial encroachment. Today those practices include harvesting food and medicine from their territory, building a Healing Centre to address impacts of colonialism, and running many camps and workshops to share skills and knowledge. They are also currently resisting, among others, the Pacific Trails Pipelines and Coastal GasLink project, which are intended to transport fracked gas from Treaty 8 territory to LNG plants on the west coast. Learn more about the Unist’ot’en Camp. The event will begin with a welcoming from Esquimalt and Songhees First Nation representatives, and a presentation from the Unist’ot’en hereditary Chiefs and Camp spokesperson Freda Huson. We will then start the music and enjoy performances by Natu Bearwolf, Betty Supple, Zoubi Arros, Rae Spoon and Compassion Gorilla. Tickets are by donation, from $15-$20 (no one turned away for lack of funds), and can be purchased at the door or in advance – online or in person at Wildfire Bakery or Camas Books. We would like to acknowledge the time that many people in our community are donating to put on this event – from postering and hosting to playing music and raising funds – and would humbly request your help in spreading the word about this benefit concert. It would be thrilling to us to pack Alix Goolden Hall and show the Unist’ot’en that people here support their courageous and important resistance. Thank you! Information about event accessibility and performer bios.